The key lifted out of the staircase, flew high above the rooftops surrounding the Old Basilica and gently swivelled. 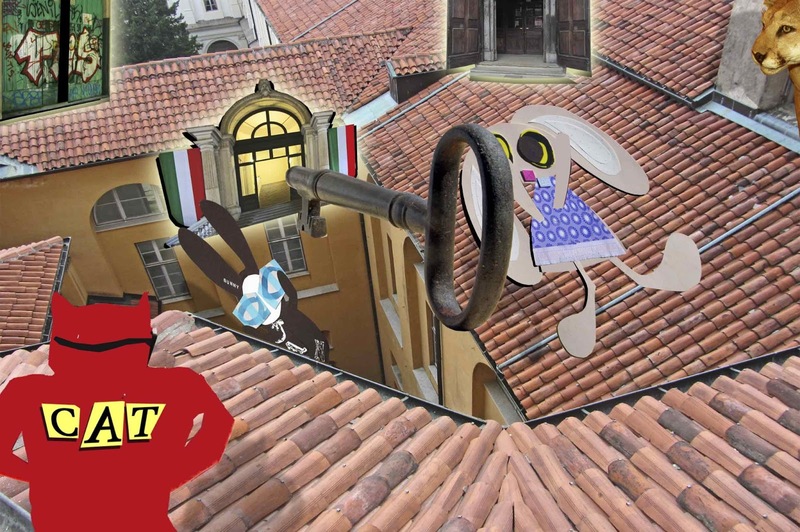 Skratch the Cat watched, flexed his paws and got ready to move as the Wabbit and Lapinette separated from the key. Puma observed them carefully as they proceeded towards three separate doorways and then he roared to Skratch. "You said stories had three keys, not doors," "Stories are far from a precise science," said Skratch calmly, rapidly unsheathing his claws. 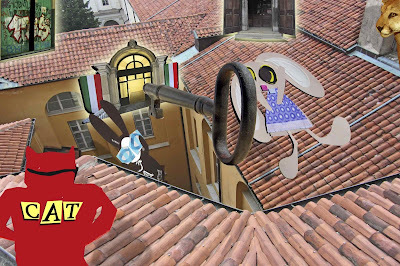 With a machine gun rattle, they made a burst of noise that awakened Lapinette and the Wabbit from their trance. "Whoooah!" yelled the Wabbit. "Ooooh!" shouted Lapinette. "What's going on?" yelled the Wabbit. "Get me down!" shouted Lapinette. Skratch lifted a reassuring paw. "Just keep going and whatever you do, don't think about being in the air." Skratch paused as the two sailed towards the doorways - and remembering the key, assessed it with suspicion. He paused for thought, then suddenly made a victory sign and shouted to Puma. "There are three keys!" "I only see one key," said Puma gravely. Skratch laughed. "Listen up Puma! When they get to the doorways, jump!" Puma looked questioningly. "You known how to jump, don't you?" said Skratch.